1991 Topps Traded Baseball is a typical spin for the venerable year-end brand. It focuses on rookies and top players changing teams over the course of the season and previous off-season. 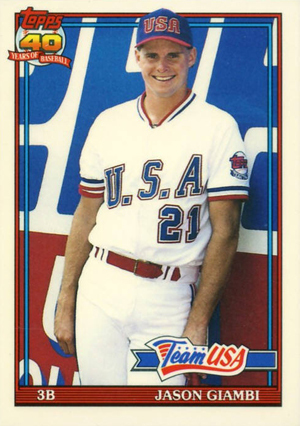 For the first time in three years, 1991 Topps Traded Baseball also features Team USA players. The result is a small set that packs a lot of punch. However that punch is somewhat diminished because of its easy availability. 1991 Topps Traded Baseball has a straightforward checklist of 132 cards. Key rookie cards include Jeff Bagwell, Luis Gonzalez and Ivan Rodriguez. Thanks to the inclusion of more than 20 Team USA members, the set also boasts rookies of Jason Giambi and Charles Johnson. As with previous Topps Traded sets, the cards stick with the year's Topps design. This means a white border accented by a pair of thin frames. The player's name and position are on a nameplate at the bottom of the card with the team name floating on a ribbon above it. A special 40th anniversary logo is at the top of the card. Card backs are red with a large anniversary logo in the background. Cards have player vitals and complete statistics. Cards are numbered with a 'T' to differentiate them from the base set. Every card has versions on two different card stocks. For the second straight year, the set was distributed both in packs and as a box set. This led to two different styles of card backs. Those 1991 Topps Traded Baseball cards coming from packs have grey card stock. Box set cards use white card stock. Given to dealers as case incentive. Card measures 1 1/4" x 1 3/4". 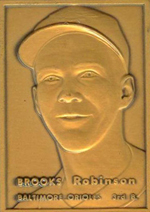 Reprints the 1957 Topps Brooks Robinson RC in bronze.